GAINESVILLE, Fla. - It was a final round for the record books today at the 50th annual Amalie Motor Oil NHRA Gatornationals between E3 Spark Plugs Pro Mod Drag Racing series presented by Hoosier Tire and Jerry Bickel Race Cars racers Todd Tutterow and Steve Jackson. Tutterow won the Wally trophy when he got the hole shot win with his 5.662-second lap at 251.86 mph over Jackson's quicker 5.643 pass at 253.95. Jackson set the Pro Mod national E.T. record but came up short for the win. 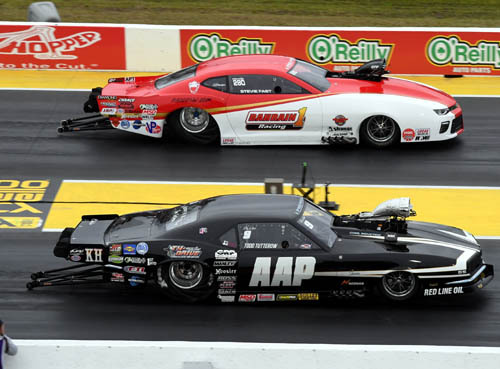 The final was the quickest side-by-side drag race in Pro Mod history. "I won a lot of races a lot of places, a lot of championships everywhere but this means a lot to me," Tutterow stated. "My mom and dad have been wanting me to do the NHRA thing for years and years and I finally got the opportunity." Todd Tutterow and crew celebrate win. 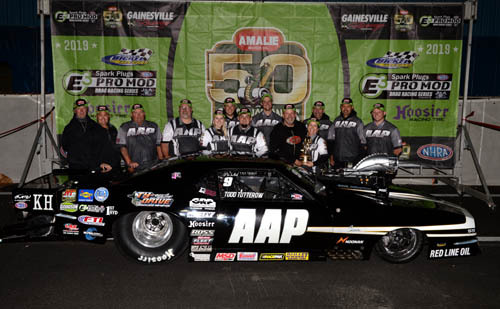 The E3 Spark Plugs NHRA Pro Mod Drag Racing Series presented by J&A Service continues at the NHRA SpringNationals in Houston, Texas on April 12-14. FINAL -- Tutterow, 5.662, 251.86 defeted Jackson, 5.643, 253.95.